Mothership | Park View, D.C.
Over the weekend, the new mural designed for Mothership — at Georgia and Lamont — was begun. 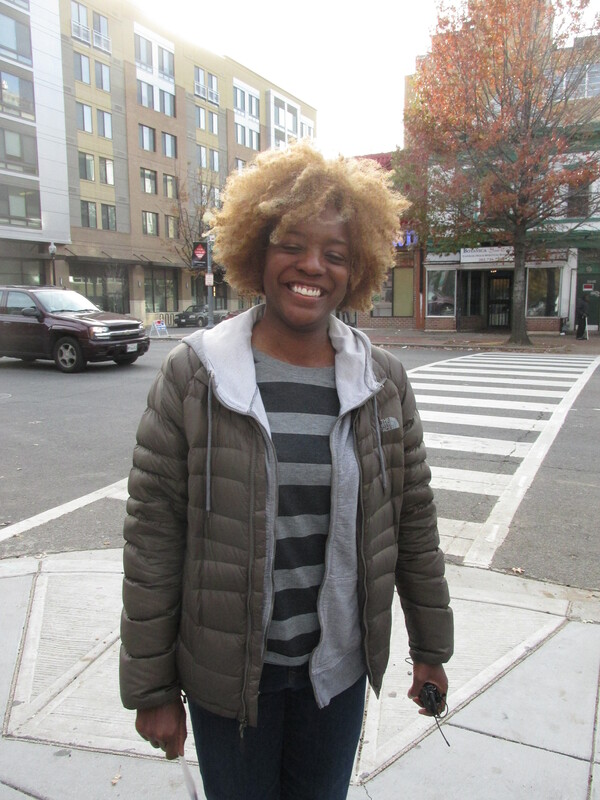 The artist of the mural is Washington artist Nekisha Durrett, and has been in the works at least since January 2014. 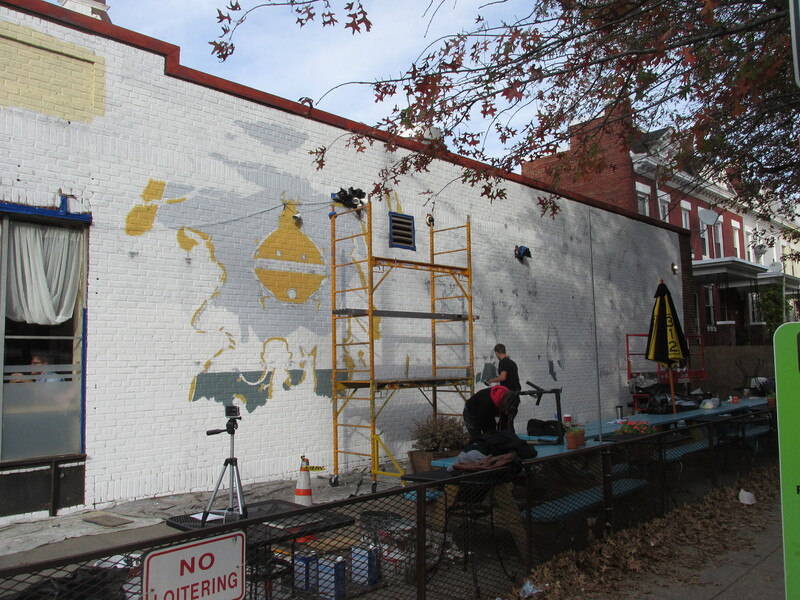 ANC 1A also voted in support of the mural at their January 2014 meeting. Nakisha, along with a crew of two helpers and two students from Duke Ellington School of the Arts who were documenting the work, were at Mothership on Sunday giving me a chance to chat with her. I got an opportunity to see the overall design and think its really going to add to the growing inventory of public art we have in the neighborhood. While I don’t have a digital copy of the design to share, I don’t think people will have to worry for long. The mural should be finished by mid-week. You can get an ideal of what it is about by looking at the image and reading the artist statement below (provided by artist). In 1975, the funk band Parliament paid tribute to the, then, predominately African-American Washington, DC with a record entitled Chocolate City which envisioned African-Americans overtaking the White House. The follow up record Mothership Connection (Starchild) imagined African Americans deeper into unchartered territory – outer space. The albums were wildly successful, especially in Washington – “the Chocolate City and its vanilla suburbs.” Nearly forty years later, DC has seen tremendous change demographically with the population nearing a 50/50 racial split between white and black residents – garnering both negative and positive opinions. Seated in the center of Washington, DC in the Park View neighborhood of Northwest, the eclectic diner Mothership is as funky as the concoctors of its namesake, Parliament. The apt name and location of this neighborhood haunt, has inspired the large scale graphic mural by Nekisha Durrett Fall In Line. In keeping with prevalent themes related to the ubiquity of popular media and storytelling throughout Durrett’s work, Fall In Line pictures a succession of gargantuan, cartoon inspired beings of various sorts waiting to board their homebound “mothership.” This playful work aspires to celebrate the diversity of the surrounding Park View neighborhood while harkening back to a time in the city’s history that could be overlooked in the bustling swell of development and change. Two Chix banner at Mothership. Though an exact start date has not been set, Mothership tells me that Two CHIX will start serving breakfast (and eventually lunch) within their space around the middle of this month … which means very soon. In checking out their Twitter feed, Two CHIX is from the same people who have the STIX Food Truck (Web site here). I haven’t seen any details yet on their proposed breakfast menu, but in following them it is clear that they are working hard to get things ready. 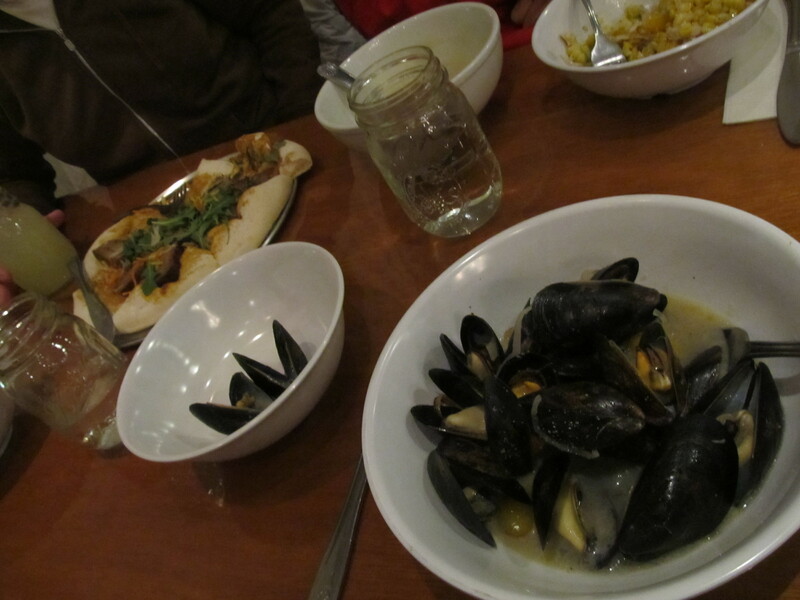 I’ve enjoyed the Mussels time and again at Mothership. When critics pick apart food trucks, they often focus on congested streets and kitchen cleanliness — as if there weren’t a single public servant devoted to these issues — while glossing over the larger business-incubator implications of the mobile vendors. Mothership, chef Stephan Boillon’s brick-and-mortar expansion of his El Floridano truck, is a prime example of how a small street operator can, in short order, become a grounded and gratifying member of the community. Mothership is one of two brick-and-mortar food truck expansions that I know of in our general area. Like Carman, I agree that “[t]he city should make sure to nurture these kinds of projects, from food truck to full-service eatery.” It helps small businesses grow in the city, and without this avenue to build business we wouldn’t be able to enjoy the great restaurant Mothership has already proven to be. So read the review, and consider giving Mothership a try. Chances are you’ll go back time and again.